As a military family, does it make more sense to buy or rent a home? The conventional wisdom is that, over time, buying a home is the more cost-efficient option over renting. Of course, military families don’t usually have the luxury to stay in one location long enough to see the return on their home investment, so for them, an essential point will be cost and affordability over the short term. Many will decide that buying a home is worthwhile, while it simply won’t be a good idea for others. If you’re considering the decision of renting or buying a home, there are a few points to keep in mind. 1) The long-term investment opportunity and tax breaks. Military families may want to make the best use of their income when considering the long-term investment opportunity of owning a home. Rather than paying rent each month, they'd rather build up equity in their own property. Homeowners can also reap tax benefits by deducting mortgage interest, property taxes, and some other expenses from their federal income tax, as well as excluding some capital gains from the sale of a home. If you choose to rent out your home later, there will also be certain tax benefits and deductions. For more information about the tax benefits of home ownership, the Tax Policy Center is a helpful resource. 2) It can make financial sense over renting. This information can help you distill the details of home ownership, renting, selling a home, rate of inflation, home price and rent appreciation rates, and the rate of return on the investments into a comparison of realistic costs and benefits for the coming years. For a clear picture of how much you’ll pay in mortgage vs. rent, use the BAH and Mortgage Calculator included on every MilitaryByOwner listing. This allows you to input home price, down payment, interest rate, and more to calculate a potential monthly loan payment. You can also start off with your maximum desired mortgage payment to calculate how much house you could afford in a location. 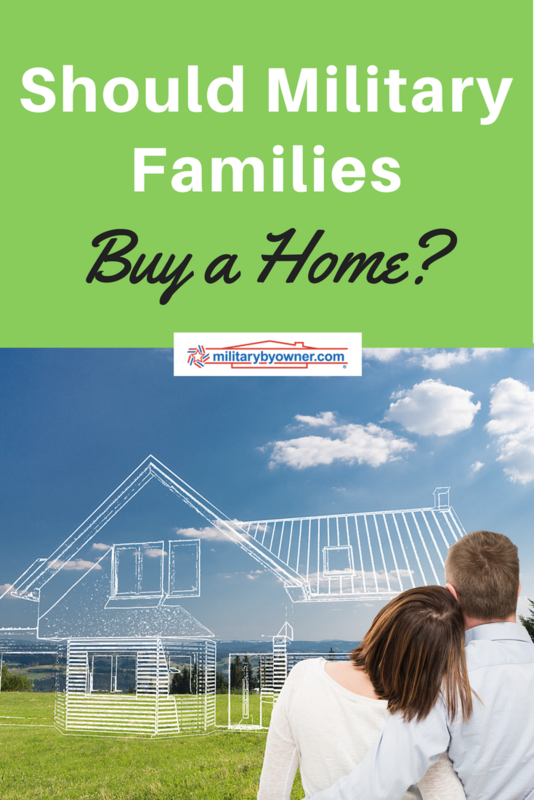 Military families may choose to purchase a home for reasons other than financial. As noted in our post Why Buy a Home at Every Duty Station? You may have a larger than normal family needing extra living space, require accessible living options, or perhaps even more acreage for pets and animals--the reasons are endless. With this in mind, as well as helpful tax deductions on mortgage interest, buying a home at each duty station could be the best route for your military family. 4) Your personal finances are in order. If you have a healthy cash reserve, have gone through the process of pre-qualification or pre-approval for a mortgage, understand your VA Home Loan benefit, and have your eyes wide open to the financial responsibilities of owning a home, you may be ready to buy a home. 5) You’re prepared to be a landlord. As an active duty family, it’s imperative to think ahead as to what you’ll do with the home you’ve bought when it’s time to move on, as well as realizing you may not be able to sell when you want, but may need to rent it out instead. MilitaryByOwner has compiled an extensive resource addressing this topic PCS Ahead: Should I Rent or Sell My Home? Tax and financial considerations, the housing forecast, future plans, and how to become your own property manager are outlined in this free ebook. Even with all the benefits of homeownership, there are times when it makes more sense for a military family to rent a home. Consider the following. 1) You prefer someone else maintain your home. You probably recognize that being a homeowner involves more than a monthly mortgage payment. If you’re accustomed to renting a home or living on base, funding seasonal maintenance and any home repairs that crop up may not be something you’re ready to handle yet. 2) Your finances aren’t ready. If your credit rating isn’t stellar, you’re not prepared for the extra expenses of owning a home, or your financial liabilities outweigh your assets, you’ll want to take time to get your finances in order before buying a home. 3) You prefer the freedom of renting or don’t want to be tied down to an area. Perhaps you'd like to move to a different area when your lease is up or upgrade to a better neighborhood. Whatever the reason--you don’t love the area you’re in, know you’ll be getting orders in a year, or simply want to be ready to take a short-notice assignment--these are factors that should be acknowledged in the rent vs. buy comparison. 4) You don't want to become a long-distance landlord. When it comes time to PCS, as a homeowner you’ll need to recognize your home may not sell and you could become a long-distance landlord. If you’re not financially or mentally prepared for what’s involved, you may want to rent. While it’d be nice to think that we move as happy little nuclear families from base to base--mom, dad, two kids, and a dog with nothing to worry about except our household goods en route to our next duty station--that’s just not reality for many military families. Of course, there will be other considerations for each individual situation as you decide whether to buy or rent a home. That’s why we’ve got you covered with our home buying ebook series, designed especially for you, military homebuyer! Making an Offer & Closing on Your New Home: Countdown to Move-In Day! The following infographic breaks down the buy vs. rent for military families. Feel free to share with the link below!